Home / Calibrate Voltage and pH Instruments with a PIE Voltage calibrator. 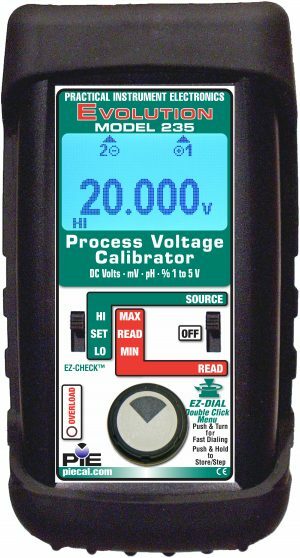 Calibrate Voltage and pH Instruments with a PIE Voltage calibrator. PIE has a voltage calibrator to fit your needs from the PIE 235 voltage and pH simulator to the advanced troubleshooting capabilities of the PIE 532 milliamp and voltage calibrator. The PIE 532 includes our patented Loop Diagnostic Technology! All the voltage/milliamp calibrators have fuse-less protection, rugged design and long battery life. With the PIE 535, source 4 to 20 milliamps or 10 to 50 milliamps into loop instruments and drive final control elements such as valves and actuators with up to 42 volts. Need to replace an Altek Voltage Calibrator?